Synthetic peptide corresponding to residues in Human EHD2 (UniProt Q9NZN4). Fetal heart, A549 and HeLa lysates; HeLa cells. Our Abpromise guarantee covers the use of ab154784 in the following tested applications. Plays a role in membrane reorganization in response to nucleotide hydrolysis. Binds to liposomes and deforms them into tubules. Plays a role in membrane trafficking between the plasma membrane and endosomes. Important for the internalization of GLUT4. Required for normal fusion of myoblasts to skeletal muscle myotubes. Binds ATP; does not bind GTP. Highly expressed in heart and moderately expressed in placenta, lung, and skeletal muscle. The EH domain interacts with Asn-Pro-Phe (NPF) motifs of target proteins. Cell membrane. Endosome membrane. Colocalizes with GLUT4 in intracellular tubulovesicular structures that are associated with cortical F-actin. 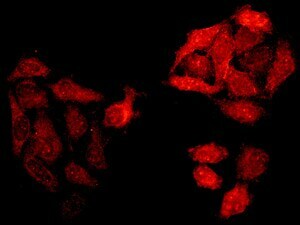 Immunofluorescent analysis of HeLa cells labeling EHD2 with ab154784 at 1/250 dilution. Publishing research using ab154784? Please let us know so that we can cite the reference in this datasheet. There are currently no Customer reviews or Questions for ab154784.